Changes in appetite are common with cancer and cancer treatment. People with poor appetite or appetite loss may eat less than usual, not feel hungry at all, or feel full after eating only a small amount. Ongoing appetite loss may lead to serious complications. These include weight loss, not getting the nutrients that the body needs, and fatigue and weakness from muscle loss. It is important to talk with your health care team if you lose your appetite. They can help find the cause and make sure you are getting the nutrition you need. Poor nutrition can slow recovery and lead to breaks in treatment. Changes in metabolism, which is the body’s process of breaking down food and turning it into energy. Such changes can occur with advanced cancer. Cancer inside the abdomen may cause irritation or swelling. An enlarged spleen or liver, which pushes on the stomach and creates a feeling of fullness. Ascites, which is a buildup of fluid in the abdomen that may create a feeling of fullness. Medications, including chemotherapy, immunotherapy, and other drugs. Radiation therapy or surgery to any part of the gastrointestinal organs, such as the stomach or intestines. Relieving side effects is an important part of cancer care and treatment. This is called palliative care, or supportive care. Talk with your health care team about any symptoms you experience and any change in symptoms. If possible, the first step in treating appetite loss is to address the underlying cause. Treatment for conditions such as nausea, mouth sores, dry mouth, pain, or depression may help improve appetite. Eat 5 to 6 small meals a day, and snack whenever you are hungry. Do not limit how much you eat. Determine which times of day you are hungry and eat at those times. Eat nutritious snacks that are high in calories and protein. This includes dried fruits, nuts and nut butters, yogurt, cheeses, eggs, milkshakes, ice cream, cereal, pudding, and protein bars or granola bars. Keep your favorite foods on hand for snacking. Increase the calories and protein in foods by adding sauces, gravy, butter, cheese, sour cream, half and half, whipped cream, and nuts or nut butters. Drink larger amounts of fluids between meals, rather than with meals, which may make you feel full too quickly. Choose nutritious or filling drinks, such as milk or nutritional milkshakes or smoothies. Ask family members or friends to get groceries and prepare food for you when you are too tired to shop or cook. Also consider buying precooked meals. Try to eat in pleasant surroundings and with family or friends. Try placing food on smaller plates rather than larger plates. If the smell or taste of food makes you nauseous, eat food that is cold or at room temperature. This will decrease its odor and reduce its taste. If you are having trouble tasting food, try adding spices and condiments to make the foods more appealing. If you have changes in taste, such as a metallic taste in your mouth, try sucking on hard candy such as mints or lemon drops before eating a meal. Ask your doctor about ways to relieve gastrointestinal symptoms, such as nausea, vomiting, and constipation. Also tell your doctor if you are having any difficulty with managing pain. Try light exercise, such as a 20-minute walk, about an hour before meals to stimulate your appetite. Consult your health care team before starting an exercise program. Exercise also helps maintain muscle mass. Meet with a registered dietitian for additional advice on meal planning and symptom management. A dietitian can also be helpful to figure out whether you might benefit from nutritional supplements or digestive enzymes. Ask your health care team if there is a dietitian available at your treatment center. Megestrol acetate (Ovaban, Pallace) or medroxyprogesterone (Amen, Depo-Provera, Provera), which are forms of the progesterone hormone that can improve appetite and weight gain. Steroid medications, which can increase appetite, improve a person's sense of well-being, and help with nausea, weakness, or pain. Metoclopramide (Reglan), which helps move food out of the stomach and can prevent feeling full before eating enough food. Dronabinol (Marinol), a cannabinoid made in the laboratory, which may stimulate appetite. Sometimes, a feeding tube is placed temporarily through the nose into the stomach. A more permanent tube can also be placed directly into the stomach from the abdominal wall if necessary. 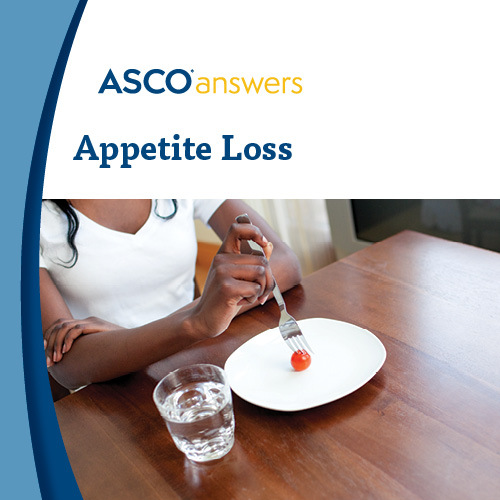 Download ASCO's free Appetite Loss fact sheet. This 1-page printable PDF gives an introduction to appetite loss, includes possible causes, treatment options, words to know, and questions to ask the health care team. Order printed copies of this fact sheet from the ASCO University Bookstore.